When the shadowy, ninja-based organization ‘The Hand’ reaches striking distance of its ultimate goal: securing a dangerous mystical resource beneath Manhattan, it’s up to New York’s street level defenders to stop them. The problem is, none of them want to be there. Can Daredevil (Charlie Cox), Jessica Jones (Krysten Ritter), Luke Cage (Mike Colter) and Iron Fist (Finn Jones) get their crap together long enough to save New York from destruction, or will they tear themselves apart trying? Like The Avengers before it, The Defenders is the endgame for Netflix’s Marvel Properties, which, of course, are Daredevil, Jessica Jones, Luke Cage, and Iron Fist. Now if you’ve been following this blog, you’ll know that my mom has only covered Daredevil and Iron Fist. We are, however, making our way through Jessica Jones. Reviews of all 3 will be forthcoming. That being said, she came into The Defenders with sufficient knowledge to not be completely lost. The Defenders was released last Friday, August 18th, with all 8 episodes placed on Netflix simultaneously, as per their typical business model. So this was the first time I’d watched a Marvel property with my mom that I hadn’t seen before and I couldn’t give her any context beyond what we already had. It was an exhilarating experience. As exhilarating as watching a TV Show with your mom can get, anyway. The Defenders starts out by catching up with our principal characters where the individual series left them last. Danny Rand, AKA Iron Fist, is hunting down The Hand in Cambodia. Matt Murdock, AKA Daredevil, has retired from the superhero life and is pursuing pro bono law wark. Carl Lucas, AKA Luke Cage, has been freed from prison and is back helping the streets of Harlem. And Jessica Jones, AKA… uh… Jessica Jones, is avoiding returning to her detective business with as much snark as possible. The first few episodes of the show cut back and forth between the heroes, and give us a great foundation of where they are in their lives and who they are as characters, giving viewers (and my mom) time to catch up. She remembered where Daredevil and Iron Fist were at, but was less clear on Jessica Jones and Luke Cage, but caught up to them pretty quickly. The intros also don’t give away too many spoilers for Jessica’s and Luke’s individual series (other than they’re still alive), so watching The Defenders ahead of them seemed not to be a problem. The show does a great job of humanizing and distilling the characters and their relationships to make them easily digestible, and by the time their disparate threads led them to Midland Circle and the signature Netflix hallway fight, my mom was familiar with all of them and excited to see them finally work together and kick some ninja butts. She was cheering when Luke Cage burst into the room to help Iron Fist, and was practically begging Iron Fist to come help Daredevil when he was in over his head (which he did). She also took an unprecedented shine to Jessica Jones. Mom said she had “never met a girl like her” and liked her “dangerous… take no crap attitude”. This from a woman who once told me to be careful when going to the bathroom. As with any superhero property, the success of the story relies on its villains, and The Defenders gives us a bit of a mixed bag. Us having already been well invested in Iron Fist and Daredevil, so we were both well acquainted with The Hand, who play major roles in those series, and were very interested to see what their ultimate plan was. Introducing Sigourney Weaver’s Alexandra as the most powerful of the Hand’s five leaders was a surprise, and we were both interested to see her top the ever present Madame Gao. Ultimately, Weaver’s Alexandra is wasted. A mystery is cultivated around her that never seems to pan out, and she is killed rather suddenly in the middle of a bad guy lecture. Elektra is a different story. My mom remembered her fondly from Daredevil Season 2 and was sad to see her brainwashed by Alexandra to serve the Hand. However, she (and I) was confused at Elektra’s sudden heel turn at the end to regain her personality, but still… somehow become evil? It seemed like a total, confusing betrayal of her character, especially as she had regained fond memories of her time with Matt Murdock. This is compounded by the fact that she essentially forces Matt to die with her at the end of the final battle. Speaking of which, The Defenders final battle comes together quite well and actually serves to correct some of the missing links from the earlier individual series. It finally provides Colleen Wing with closure and a final confrontation with Bakuto from Iron Fist, a battle that my mom was thankful to see, even worrying about Colleen’s safety in the process. Misty Knight finally loses her arm. I didn’t bother explaining the existence of Misty’s robot arm from the comic books to my mom. It didn’t seem necessary at the time. And it finally gives us a fleeting look at the dragons so desperately missing from Iron Fist. Turning their bones into the mysterious macguffin the Hand was searching for patches up Iron Fist, but still leaves a little more to be desired. After the dust settled, mom earnestly believed that Daredevil was dead up until the very last scene, where it’s revealed that he had been saved. This upset her to no end because she wanted the show to “end properly” and not leave her hanging for another year or so. Unfortunately, since comic books and comic book adaptations are permanent second-act storytelling, this was never going to happen. That being said, The Defenders kept her hooked and engaged to the very end. This was her first, and possibly last, experience with binge watching, as we covered all 8 episodes over the course of the weekend. She lamented “being dead to the world outside”, but was so engrossed, in the “intense” and “very interesting” story, I guess it didn’t matter! Mom was really impressed with Elektra managing to take out all those ninjas in the dark. She was also impressed that Danny had his own plane and helicopter for some reason. Mom has a love hate relationship with Madame Gao. She thinks she’s evil, but seems to like her and thinks Wai Ching Ho does a great job of playing her. I’d have to agree. For someone who doesn’t like humor, she was roaring at all of Jessica Jones’ eye-rolling commentary and, surprisingly, her casual alcoholism. She seemed indifferent to the amounts of violence and head/hand chopping here. Perhaps she’s being desensitized. When I explained that the ‘Maggie’ referenced in Daredevil’s final scene was his mother, and that Season 3 would pick up on this, my mom decided to give the cliffhanger a better verdict. 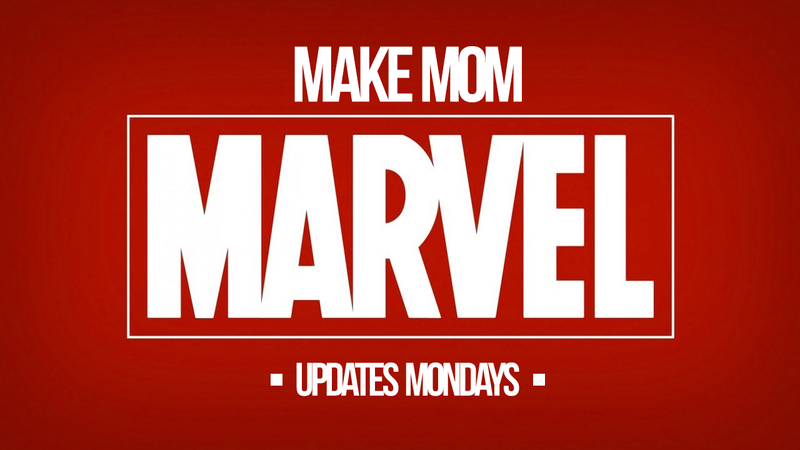 We’re going to be pushing coverage of Marvel Phase Two back a few weeks. Next week, we’ll be going back in time and covering Daredevil and Iron Fist, with Jessica Jones soon to come.